For the fourth consecutive year, Soltec Ltd. was part of MachTech & InnoTech Expo, the specialized international exhibition for machinery, technology and industrial equipment. The event took place in Sofia at Inter Expo Center and lasted for 4 days, from 26 to 29 March. 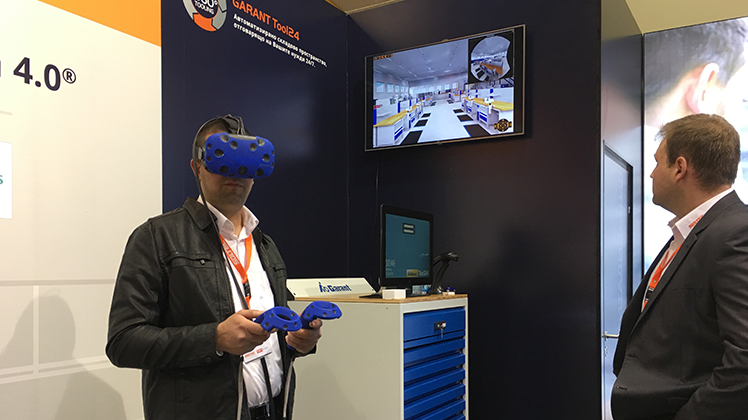 It was attended by more than 130 companies and visited by over 4000 guests working in industrial companies or having a professional interest in the machinery world. Soltec's stand was located in Hall No 3, Stand A7. Every visitor had the opportunity to look at the products we offer and learn something new about our services. Our virtual reality station was a real hit, where every visitor one had the opportunity to dive into another world and spend time in computer-generated industrial space. Hoffmann Group's industrial tools and equipment were also exibited. The company is the largest and most comprehensive supplier in the field of industrial tools and equipment in Europe. It develops two own brands - GARANT (premium series) and HOLEX (good quality at economical prices). The Siemens PLM software received due attention. Videos with the interface and the capabilities of the programs were constantly played on a separate screen. Siemens PLM is the only platform in the world that provides complete product lifecycle management (PLM) solutions from planning to production and maintenance. The robotic arm of UniversalRobots was mounted in a prominent position and demonstrated its flexibility, intelligence, precision, and resistence. UniversalRobots is among the top companies producing collaborative industrial robots. 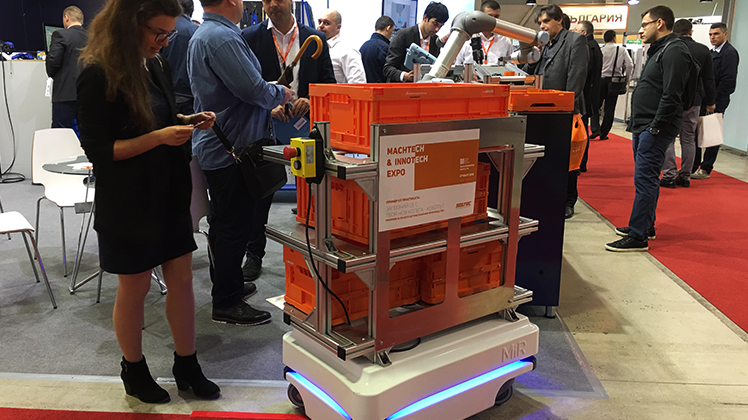 The Mobile Industrial Robots mobile robot moved around the halls of the exhibition and impressed visitors with their many possibilities. It “handed out” invitations to our presentation, part of the seminar program of the exhibition. It impressed visitors with its intelligence, intuitiveness and maneuverability. What caused the greatest interest during the exhibition were the mobile industrial robots and the collaborative robots. They were also the subject of the presentation “Meet your new colleague - the cobot” of our two outstanding guests. Jasper Zone, MiR representative, was the first speaker. He presented his vision of the revolution in logistics and the role of MobileIndustrialRobots in it. The company is one of the fastest growing in the industry. More than 800 robots are being produced each year to help many companies in the manufacturing and health care sector move goods and materials. The company has 121 representatives in 39 countries worldwide, and Soltec is the official distributor for Bulgaria. MobileIndustrialRobots has won several international awards. About 80 employees currently work in the company and the company plans to hire 50 more in 2018. MiR Robots are used in the work process of some of the world's most famous brands such as Toyota, Boeing, Adidas, Magna-Power, Gucci, Michelin, Ericsson, Bosch, Unilever, Danone and others. Mr. Zone presented the innovative technology that makes mobile robots move safely in warehouse and factory spaces. They are equipped with two lasers that register movement or objects at a distance of 8 meters in 360˚ diameter. Robots can work side by side with people and support the work process. The advantages of integrating MiR into your company are many, the most valuable among them being that you have the ability to automate some logistic processes and thus free valuable time of your staff. Mobile robots are installed easily and quickly, and can be redirected to a variety of tasks depending on your needs. As a result, you will notice an increase in performance and productivity. The investment for a mobile robot most often returns within one calendar year. Josef Schatti, founder of Soltec Ltd., was the second speaker. He emphasized on the digitization of production processes at present and in the future. He presented the trends in the field and his words prompted many questions. According to the forecasts he presented, between 2010 and 2030, the so-called babyboomers generation will leave the labour market. This will cause a shortage of qualified staff but will open new opportunities for integrating innovation. The Y and Z generation, who are more technically literate, will be at the forefront, but they may lack leadership skills. This series of events will lead to a shortage of skilled workers and the need to implement more digitization and automation solutions. Demographic data, not only in our country but also in Europe as a whole, foresee a demographic crisis. Factors for this are many, but the most important among them are: emigration, problems in the education system, low birth rates, aging of the population. It is expected that in 2080 the population in our country will have dropped to 4.5 million people. Under such conditions, companies will have problems not only with the recruitment of qualified employees but also of workers in general. At the same time, the Industry 4.0 trends are that companies are going to implement more robots in their business, because in today's context, their numbers are constantly growing. There are many examples of companies that are able to combine the benefits of automation with human capabilities. This strategy makes it possible to reduce the cost of a number of products, making production processes more flexible and consistent with constant market changes. It is expected that by 2025 the cost of a mobile robot will fall by 65% and make this technology much more accessible globally. The question we ask is: Isn’t it better to teach people how to operate robots instead of making them do repeatable and often difficult tasks? Isn’t it better to start now and be ready for the future? Every entrepreneur and business owner should ask himself: Am I going to be from the people who act now, or from those who wait and remain passive? Mr. Schatti’s presentation was inspiring and gave birth to serious thought. The guests who attended the event had the opportunity to ask their questions directly to the lecturers Jasper Zone and Josef Schatti. 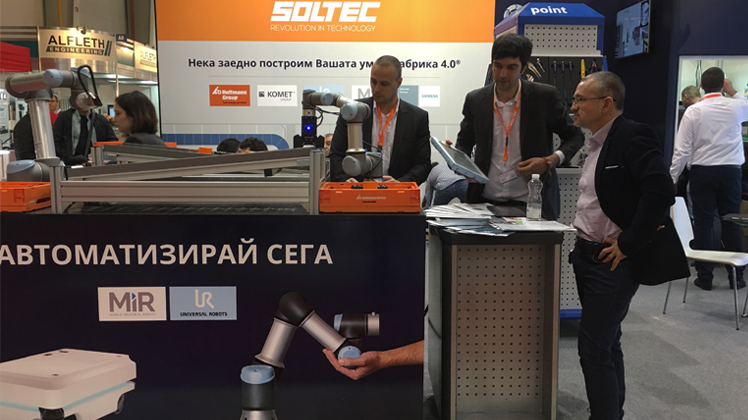 We, from Soltec, thank all those who took part in the presentation “Meet your new colleague - the cobot” and visited our stand at MachTech & InnoTechExpo 2018. Thank you for your interest in our goods and services. We hope we were useful. If you have further questions, please contact us at 032 500 425 or write to us at sales@soltec.bg. Let's build your smart factory together!